Every year only a small number of his watercolors are offered for sale. In 2014 Christies sold four of his watercolors at auction, the top lot selling for $965,000. In 2015 Sotheby’s sold three, the top lot attaining $2,650,000. 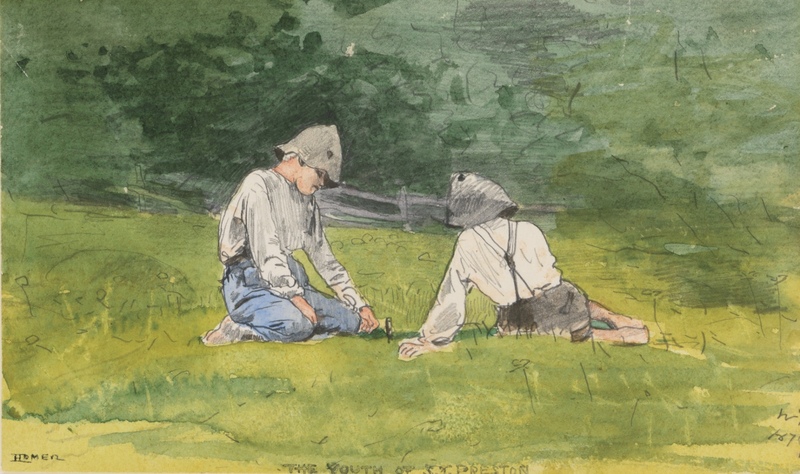 Lark Mason Associates is proud to present two watercolors by Winslow Homer for auction this fall. These pieces, both of which are listed in the catalogue raisonné, have never before been offered in the public market. They have been held in a private collection of a prominent Boston family for over 100 years. The sale of these watercolors will be held in iGavel Auctions’ November/December Sale of Fine Art and Antiques, beginning November 14th and closing December 5th, 2017. Both works are available for public viewing in the New York City gallery of Lark Mason Associates through November 16th and by request to the close of the sale. Born February 24, 1836 in Boston, Massachusetts , Winslow Homer began his career as an illustrator. It was in this capacity that he was sent to the front lines of the Civil War by Harper’s Weekly. Here he honed his painting and drawing skills. After the Civil War Homer’s career continued to grow. Traveling to both Paris and England, he found his greatest successes in landscape and seascape painting. It was during the summer of 1873, while staying in Gloucester, Massachusetts, that Homer began painting with watercolors on a regular basis. And it was here in Gloucester, in the late 1870’s that Homer established once more his strong love of the sea through the power of his brush. The watercolor above, Off Gloucester, painted in 1880, is an example of his work during this important time in his career. This painting is available for bidding November 14-December 5, 2017 on iGavelauctions.com. 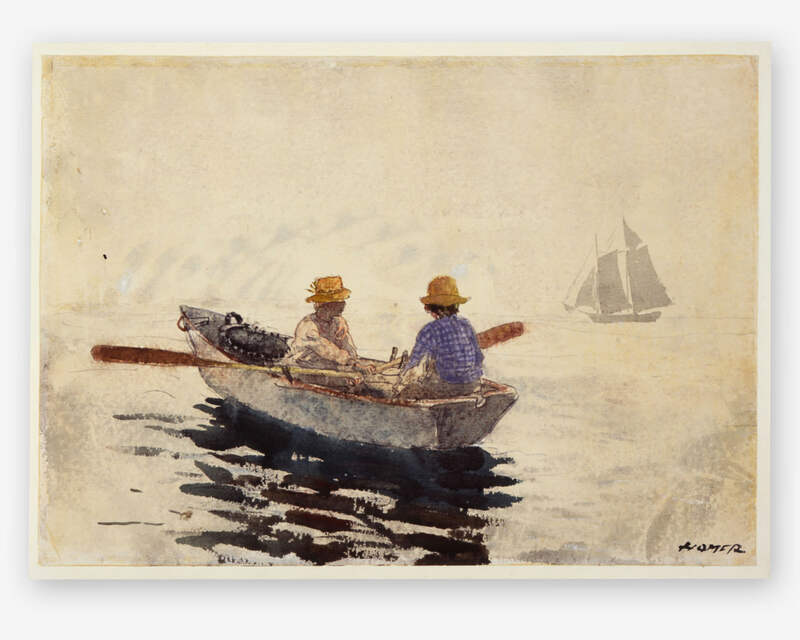 A similar watercolor painted the same year, and of a similar subject matter and composition is illustrated below, again of boys in boats. During this same period Winslow Homer focused on simpler subjects seen in rural life. His paintings and watercolors were inhabited with young children in fields and in idyllic farm scenes. In 1878 he took a trip to the country home of Lawson Valentine, his patron. Here on Houghton Farm, near Mountainville, New York he produced approximately 30 watercolors. One of these, Apple Picking, is in the collection of the Terra Foundation for American Art and shares the same innocent and unassuming qualities with the watercolor below offered by Lark Mason Associates in the same sale as the above boat scene. 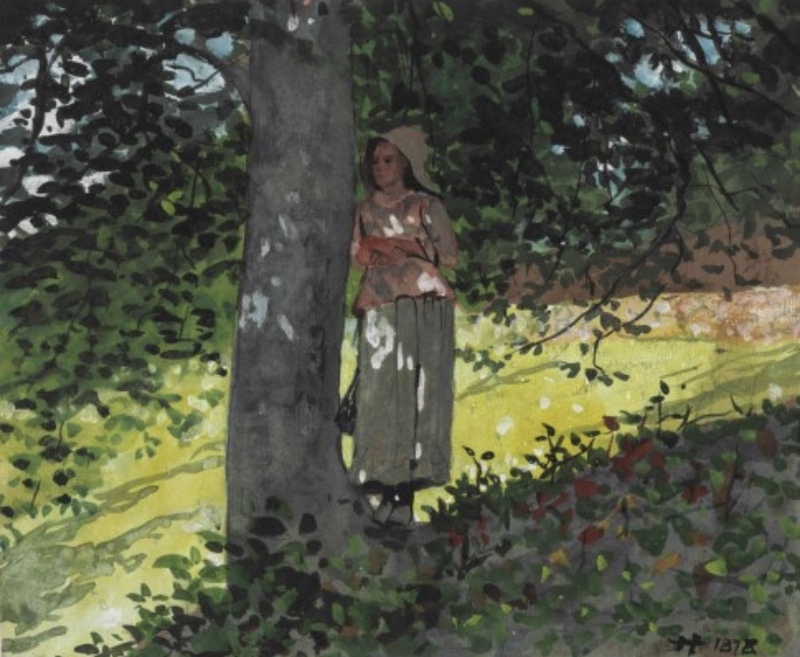 In 2002 Christie’s offered a watercolor of a similar pastoral subject matter, painted at Houghton Farm. Like the above painting, it had a strong provenance, with good exhibition records. It sold for a price of $493,500; the work was offered again in 2014 and achieved a price nearly twice as high, $965,000. 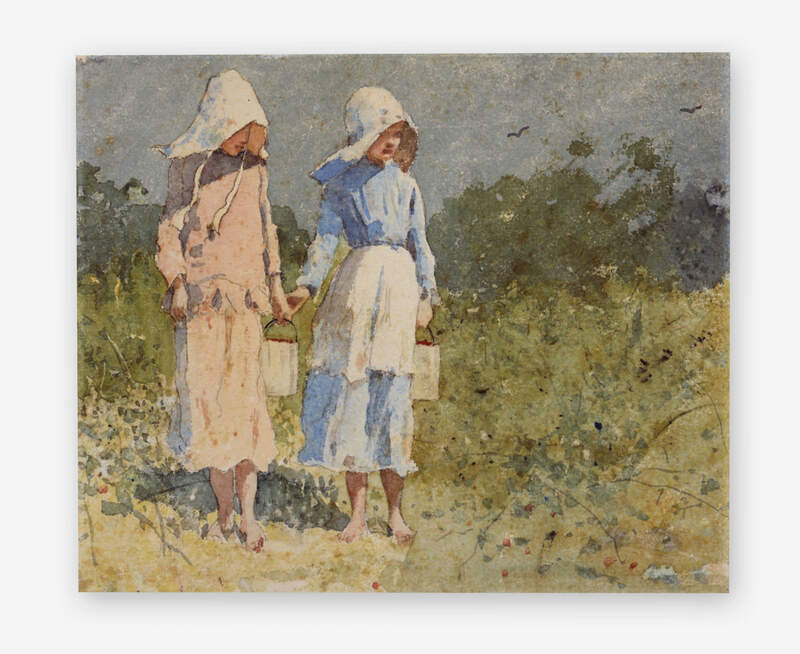 Going Berrying, painted in 1879 illustrates the charming innocence young girls, holding hands as they walk barefoot through soft fields. A smaller work of similar style, shown below, of young boys playing idly, was sold by Sotheby’s in 2014. This work was painted in the same year as Going Berrying, and shares the delightful qualities of an idyllic life in quiet watercolors. Both represent a sense of hope for a peaceful future after the Civil War. Winslow Homer was a truly talented artist. He once wrote, “You will see, in the future, I will live by my watercolors.” Time has proved the truth of Homer’s statement. 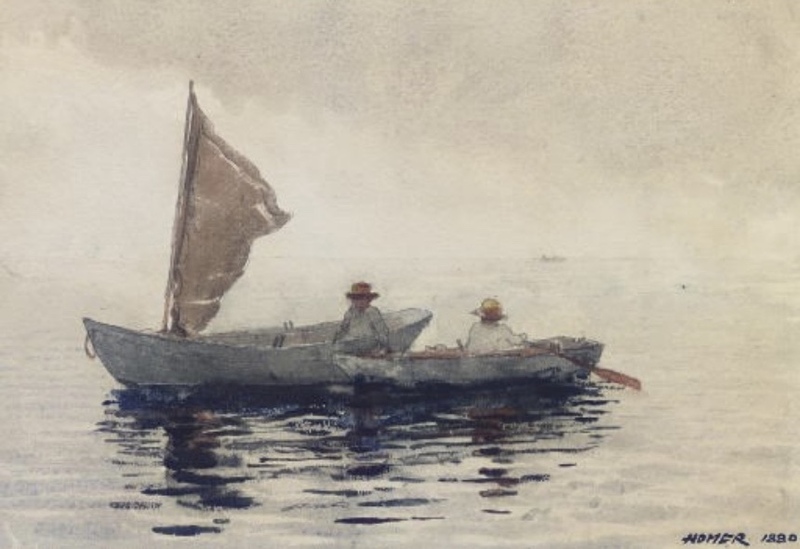 But he surely did not realize that over 100 years after his death many Americans would also “live by” his watercolors, finding both joy and vitality in these simple yet strong works of water, pigment, and paper. Horace Dwight Chapin, Brookline, Mass. Margaret Chapin Osgood, Boston, Mass. MFA, Boston, 1911; Copley Society 1921, no. 28.